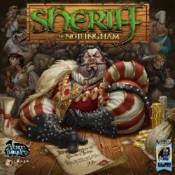 The Sheriff of Nottingham is a fun and engaging game for all where each player will have the chance to step into the shoes of the Sheriff himself. Other players, acting as Merchants will attempt to bring their goods into the city for profit. Beware though, while many may act as honest merchants, there is always the possibility of contraband being smuggled into the city. Experience Nottingham in a whole new way. Declare your goods, deal with the Sheriff and secure victory in a fun-filled and exciting adventure.